WHY does everyone have to suffer whenever the government wants to crack down on a few trouble makers? David Cameron plans to ban cheap booze in a bid to stop binge-drinkers wreaking havoc in our town centres. He could do it by enforcing the existing law which makes it an offence to sell alcohol to people who appear to have had one too many. But official figures show that only EIGHT landlords have been convicted of the offence in two years. Let’s be clear, putting a minimum price on supermarket beer, wines and spirits won’t stop boozed-up hooligans or problem drinkers. It will hit the less well-off who rely on a cut-price glass or two as a weekend treat, while the price of Chablis and Champers enjoyed by the middle classes won’t go up. Ministry of Justice statistics show five licensees were convicted for selling alcohol to drunks in the whole of England and Wales during 2011, the last year for which figures are available. It was only three during 2010. If there really is a problem with drunks pouring out of pubs at closing time then why haven’t there been more prosecutions? These figures will inflame a furious Cabinet row over plans to impose a minimum price of 45p a unit on all alcohol. Selling booze to a person who is drunk carries a £1,000 fine under the 2003 Licensing Act. Alcohol consumption is already falling, according to the Office for Budget Responsibility. It forecasts that by 2018, Britons will be drinking 2.4 BILLLION fewer units – even without minimum pricing. Tory MP Graham Brady, chairman of the powerful 1922 committee of backbenchers, urged ministers to enforce existing laws rather than clobber responsible drinkers. He said: “Government already interferes far too much in people’s lives. Miles Beale, of the Wine and Spirit Trade Association, added: “The government should enforce existing measures designed to combat problem drinking. “Minimum pricing is unfair, ineffective and probably illegal. Why should responsible drinkers pay more? 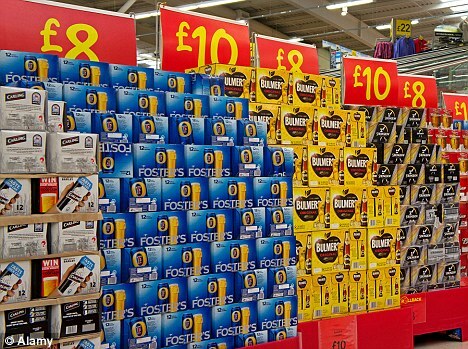 A long and costly legal battle is already under way in Edinburgh over minimum pricing. A law passed by the Scottish Parliament last year is being challenged on the grounds it breaches EU fair trade laws. Minimum pricing would add about £600 million to the nation’s annual drinks bill. It would mean a bottle of Tesco Chilean Chardonnay wine rising from £3.99 to £4.23. The store’s Everyday Value Whisky would shoot up from £11.00 to £12.60. And 4x440ml of Sainsbury’s Crown Lager would increase from £3.47 to £3.96. Similarly 4x500ml of Asda Belgian Lager would rise from £3.94 to £4.50.